« What Is the Casual-But-Professional Uniform For Women? it’s very nice but i think round toe is more current these days? In style, out of style, don’t like pointy pointy toes. I have been hunting for beautiful pewter office-appropriate shoes. These are great, but sadly not available in my size. Didn’t realize that the pointy toed shoe was back in style — Does anyone else find that they make their feet look jumbo-sized? I always feel so self conscious of wearing them for fear of resembling a (better-dressed) bigfoot! yes; I hate pointy toes for that reason. I think there’s pointy and then there is pointy. A slight point is very appropriate & does not really make your feet look longer; a very pointy toe is a bit dated and does make your feet look rather lengthy. Think of one as brooks brothers classic, the other as wicked witch of the west shoes. Hmm did not consider differentiations in pointy-ness beyond ‘snip-toe’ and ‘pointy’ — love the wicked witch imagery! Cute, and totally remind me of the FLOTUS, Michelle Obama. Circa Joan and David makes good cushioning in their shoes, too. I personally prefer 3-4″ inch heels, though. Dunno why; it’s been this way since wide leg pants became stylish in the early 2000s, I suppose. Super pointy is out; regular pointy is classic and still in. regular pointy is always going to be a classic. and anyone who wears only one style of toebox is booooooooring. Wow – I wish I could do 3 inch heels without tottering all over the place! A kitten heel is much lower, fyi – think small diameter, half inch — a two inch heel is still a serious heel! These are fine, not fabulous…sensible, not sensational! I agree that the pointy toe is a thing of the past, and that this mid-heel height is not very flattering…and with a buckle to boot! I like the coloring of the shoe but would prefer it on a three inch heel and a rounded toe. All I want is one pair of black heels that have no patent leather … I am sick of the patent look. I recently bought the Cala Leather Heel (Lauren by Ralph Lauren) in black and LOVE them. I think pointy toes go in and out so often that they’re always in, if that makes sense. pin-stripes go out of fashion? noo…. i love them! any insight? like are there certain types of pin strips that are more seasonal/trendy than others? i always thought they were a classic. Sounds like a suit event… the good news is that you won’t be frozen out by the perenially over-enthusiastic air conditioning that seems to be a hallmark of day-long seminars held in big rooms without windows! I live and work in Honolulu. Just attended a similar seminar in my practice area: it was blue jeans, linen pants, high heel sandals, cotton shirts in spring colors. But, of course, it’s Honolulu, and we are different here. And my practice group? Criminal defense lawyers, always less inclined to take themselves seriously.
. . . Guess that’s not too helpful. I am never thrilled with a pointy toe, but I do not like the shape of the heel at all. I do not think that is this year’s heel. I’ve not heard anyone discuss their difficulty wearing any shoe besides a sneaker because they have zero fat in their feet, narrow heels (that slip out of everything) and regular width at the front of the foot. Everything hurts! Is there anyone else out there with this problem and have found the “answer” other than fabric sandals? Thank you! I have exactly the same problem. Everything’s too big at the heel and my little toes seem to suffer in whatever shoes I buy, no matter the toe shape. I can’t offer any advice, but I can empathize. I feel your pain! I have horrible bunions (I wish there was another term that didn’t sound so gross) and everything hurts. Wide in the front, narrow in the back. Also a bit flatfooted. I’ve given up and wear flats now, but they still hurt. Not appropriate for most offices (not law firms at least) but I love Dansko clogs. I never loved the way they looked but they are more comfortable than being barefoot. Great arch support, wide in the front. Takes some getting used to but they’re great. I’m with Ballerina Girl – Danskos are the way to go. I’ve got the same kind of foot: narrow heel that nothing stays on (not even sneakers – slingbacks are the worst! ), and wider forefoot. I’ve found that the Dansko staple-sided clogs with obvious staples are slightly narrower, and thus fit my foot better, than the stitched ones, like the ubiquitous Professional. I’ve got Danskos under my desk now – they’re on my feet as soon as I’m ready to head out! If my heels are gonna slip out of shoes anyway, better to wear clogs. For a dressier look, I like Cole Haan Air pumps. They stay on my narrow heels and don’t crunch my pinkie toes too badly. I have different problems, but I wear a lot of clogs because they aren’t supposed to fit in the heel. They are held on at the instep. Probably not a good wear-to-work solution, but you could look at some of Dansko’s non-clog styles and see if they fit the same. RC, I have the same problem – narrow heels, and wide toes that hate being jammed into closed toe shoes. I like flat/how heel boots because they grip at the ankles & provide support there. I also recently purchased 2 pairs of Hush Puppies Mary Janes on Endless. They are low heel. I got the wide width, but the cross strap basically keeps my foot in place though they are slightly loose at the heel. I even wore one of them for one of my choir concerts & my feet actually held up pretty well (compared to my other shoes in the past) through an hour of standing! I never realized it, but this is exactly my problem. My heels slip out of shoes unless I buy them half a size smaller than would make my toes happy. I’m so relieved to know that there is a reason I can’t wear high heels without pain and blisters. I thought I was just a wimp. I have difficult-to-fit feet, plus inner-ear grief and therefore bad balance. Naturalizer is my friend. Love Naturalizer… Wish that they had more non-old-lady styles, but when I find shoes that are cute from them I’ve been known to buy them in black, brown, navy… oh yeah, that good. I love Privo! The casual ones. I haven’t tried the heels. OK, well I might have a semi solution for some of you with narrow heels. I cut my sportsocks off at the arch so it beefs up my heels and then put a pretty trouser sock over that. Just won’t work for a dress, but my boots and loafer-like shoes fit much better (Munro Cindi Pump) with this adaptation might be an option. The sock keeps your foot back so you aren’t sliding forward and crushing the bony toes. I wish Dansko would work for me, but I’m in sales, and have to look a little more dressy :( Thank you for the support (no pun)! There are adhesive inserts you can buy (in pairs) that line the inside of your shoe where your heel hits. They are very cushion-y and relatively cheap ($3-5 per pair). I find mine in Target in the shoe section, on the rack where they stock shoe care products. I find that these really help – I am wide in the toes and when I buy a wide width, my heels always slip out. I was just going to suggest that! You can experiment — some are cushier & thicker than others. While you’re experimenting, I would recommend you stay away from the super gel ones — at least the drug store brand versions, in my experience, do not stay on long & become a serious mess in the heat. Used to be a dancer and I stuff the lamb’s wool from my toe shoes into the front of my normal shoes. This keeps my foot back. Also use the more expensive CVS heel inserts. These two methods usually keep my foot in place withough having to go down half a size and kill my toes. I have the black/cream camilia. Makes me feel like I’m in a 1950’s movie. Unique, comfortable, flattering, and crowd-gathering. I suffer from the same foot issues and have flat feet. 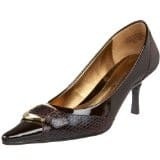 Found that Ferragamo 2.5-3″ pumps work best in the D width (not available in the US, or so they said) and Weitzman as well. Try Bruno Magli. All of the above v expensive but I shop the sales and have snagged them half price. Good luck! If you’re in the US, you have much more choice than I do in Asia. Pointy toes are out? Seriously? If I wear them still is that laughable? Not only do I think they look more elegant when pointy-toed but how is a girl to keep up? Just want to know if it’s laughable to wear pointy-toed. I’m hoping Sharon who posted above is right and that they just go in and out of style. AND I just heard all these people talking about how flip flops unless at the beach are horrible. AND when my cousin saw me in my sporty ballet flats today she said they were cute and that she wanted to get a similar pair “when they were in a few years ago.” Wonderful. Don’t listen to the drones that follow what’s “in” each year. It’s always best to have some individuality and personal style. I forgot to say I think pointy-toed look more elegant and are more timeless classic and give better and cleaner lines than round or squaretoe, but maybe that’s just on me. I agree. I always feel like pointy provides a dressier look. I agree! A slight point is timeless. Personally I find that the rounded toe styles make people’s legs look stubby whereas the pointed toes help elongate the leg line. Just my 2 cents, but I proudly wear my points whenever I want to look classic and professional! I think someone already said this above, but there are different pointy toes. For a while, an almost comically long point was in, which is not anymore. A classic point, though, will always be fine. the buckle reminds me of “pilgrim shoes”, and combined with the heel height, looks matronly. Now, thread hijack! I have an interview tomorrow. I’m exceedingly nervous (I’m not the best interviewer in the world, and I really need a job). Tips, anyone? Especially when we get to the dreaded “do you have any questions for me?” portion of the interview. What are some good questions to ask the interviewer? – Management style – great time to get a feel for your potential new boss – are they someone who likes morning e-mails detailing your progress on projects or would they prefer to hear from you on a need-to-know basis only? – Ask if you’re going to be working with other departments/divisions – the phrase ‘matrix organization’ is a key term here for working cross divisionally. – Emphasize that you are a team player whenever possible. – Company culture — this is a softball question because people love to talk about themselves – and the company culture is an extension of that. – If the company has been in the news lately, be aware of it. If they have a specialty/major client/etc., be aware of that too — If you get caught off guard try to hide it! Just relax and have a conversation with your interviewer. You’re talking about something that no one in the world knows more about: you. I can’t give you any job specific questions to ask, but I always close with something like “I’m always looking for new books to read. Do you have any recommendations?” I’ve been remembered (in a positive manner) weeks later because of it. I am in the same boat, and also always struggle with the questions thing. I really want to ask 1.) how much does it pay, 2.) how many weekends will I work, and 3.) must I wear pantyhose, but obviously those are inappropriate. I like to ask about the interviewer- what do they like about their job, interesting projects they are working on, their career path. Most people can talk alot about that, and everyone likes sharing a bit of their own story. So true – and I really want to say “no, I don’t want to leave it open ended for me to work EVERY weekend over the summer”… but alas that’s also on the things-not-to-say-if-you’re-ever-going-to-get-a-job list! Thanks guys! Helpful advice as always. And yes, the questions I want to ask and the questions I can actually ask are usually so far apart. I would really like to ask “so what do you think when females wear pants instead of a skirt to interviews?” just to find the people out there who still care about this. @Shayna, you can and probably should ask that question. You just have to phrase it a little differently.